Coconut oil most certainly seems to be the buzzword these days when it comes to health and wellness. Every health blog, magazine and TV show seem to boast the numerous benefits of this tropical fruit’s oil. The list of benefits and uses of this oil goes on and on and on. According to studies, populations that include a LOT of coconut into their diets are among the healthiest in the world. Coconut oil can boost our metabolism, give us an energy boost, kill off bacteria and infections in the body, lower cholesterol levels, reduce heart disease and more. It’s almost too good to be true, but it isn’t! For years, society was so afraid of fat in foods. Fat was bad no matter what. We focused on very low fat diets when in fact, not all fats are created equal. This is the case for coconut and coconut oil. The fats in the oil are considered healthy fats and the kind that help our body rather than clog our arteries. That being said, there’s no reason to go out and chug a jar of coconut oil, all things in moderation. However, adding a bit to your diet can certainly bring you lots of benefits! I just so happen to have a super tasty way to start adding some coconut oil to your diet. Introducing Freezer Fudge! 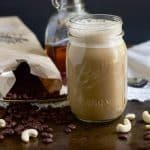 This has to be the absolute easiest type of recipe there is out there, unless you count peeling a banana cooking. 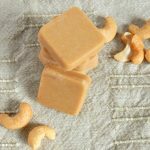 I have been working to create several flavor combinations and am excited to start with Maple Cashew Freezer Fudge. These recipes really consist of nothing more than stirring some ingredients together, freezing to set and then digging in. I am always looking for a small bite sized treat after lunch or dinner and these have been doing the trick for sure. When you go to look for coconut oil, make sure to get the cold pressed, unrefined. This is the least processed version of coconut oil. I also typically get organic as well. Melt the coconut oil before measuring it for the recipe. Also, if you have some leftover Maple Cashew Butter that you need to use up, you can easily use it for this recipe. You can store this in the freezer but it’s really not necessary. The freezer just allows them to set. Feel free to toss them in the fridge if you like. Just watch out, these will melt in your mouth and surely becoming very addicting! Whisk all ingredients together in mixing bowl until smooth. Spoon into small silicone candy mold or into a small pan or dish that will allow for at least one inch thickness. Freeze for about two to three hours. Remove from silicone mold tray or cut into bite sized pieces. Can be stored in the refrigerator or the freezer. Note: I used the silicone tray found on my products page. Didn’t have enough cashew butter so did 3/4 cashew and 1/4 almond.. Setting in the freezer now, can’t wait! Should work just fine! I hope you like it!